Grandparents and grandchildren - it's a beautiful family relationship based on unconditional love. Celebrate that special love with this wonderful Grandparents Day card showing an active grandmother and grandfather enjoying a picnic with their young grandchildren. 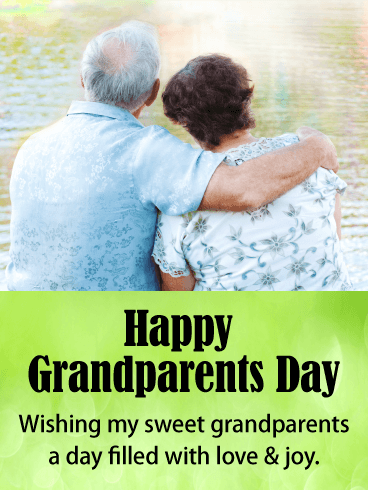 Wish your grandparents a happy Grandparents Day from near or far, and bring them joy on their special day by sending this delightful Grandparents Day card. A grandmother and her granddaughter. A grandfather and his grandson. These are special relationships like no other. The photos on this Grandparents Day card show grandparents and their grandkids making pleasant memories together on a beautiful day in the park. Show the grandparents in your life how much you love and appreciate the relationship you have by sending this sweet Grandparents Day card. A young boy and girl enjoy a walk on the beach with their grandparents on this delightful Grandparents Day card. You can practically feel the warm sand between your toes and hear the waves! Help your children send their love to their grandparents on Grandparents Day with this terrific Grandparents Day card. They will be touched to be remembered in such a sweet way on their special day. Grandparents are the heart of the family, and this sweet Grandparents Day card lets your grandparents know how much they are treasured. Wish them a day filled with love and joy with this charming Grandparents Day card. A photo of a grandma and grandpa relaxing and reminiscing by a lake makes a lovely image for this Grandparents Day card. You can't go wrong, no matter what your age, in choosing this Grandparents Day card for your sweet grandparents. Grandparents are treasures to cherish. Having loving grandparents in your life makes your life so much richer. Celebrate your wonderful grandparents on Grandparents Day, and let them know how important they are to you. Send then this lovely Grandparents Day card, which features a pleasing photo and a heart-warming message. 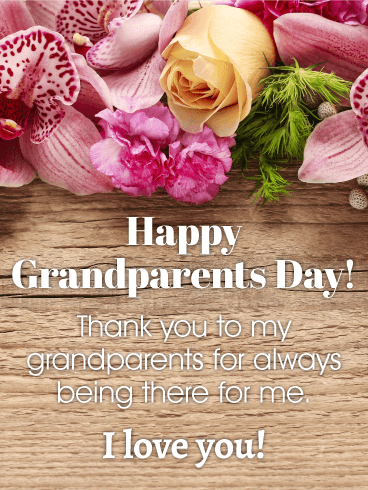 This is the perfect Grandparents Day card for adult grandchildren to send on Grandparents Day to recognize the amazing grandparents in their life! 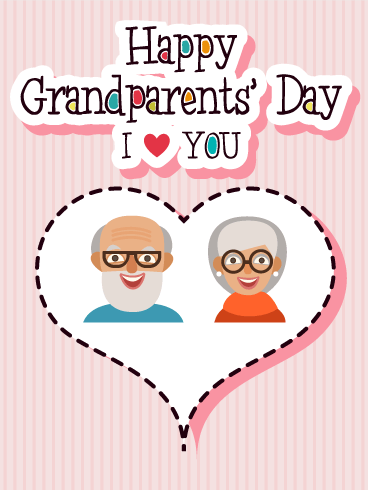 Wish your grandparents a happy Grandparents Day with this cute Grandparents Day card! 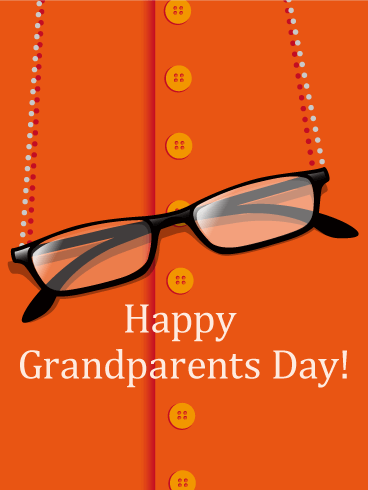 Reading glasses dangle in front of a bright orange shirt on this striking and attractive Grandparents Day card. A simple and heartfelt wish for a happy Grandparents Day completes the image. This Grandparents Day card would be a great choice for adult grandchildren to send to their grandparents to show them that they are remembered and appreciated. This joyful Grandparents Day card is just the ticket for families with young grandchildren. This charming card features a child's drawing of children in a hot-air balloon, lifting off with happy waves. This delightful Grandparents Day card will show the grandparents in your family just how much they are treasured. Make their Grandparents Day a special one this year by sending them this Grandparents Day card from their treasured little grandchildren. This adorable Grandparents Day card is perfect to send to grandparents of very young children for Grandparents Day. A bright and colorful child's drawing of flowers graces the front of this sweet Grandparents Day card. Grandparents will know they are loved and cherished when they receive this Grandparents Day card on their special day. 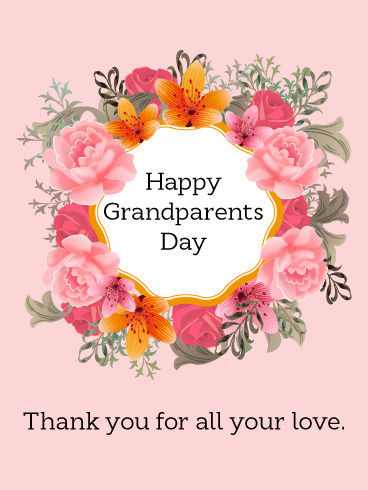 Mom and Dad, choose this Grandparents Day card to send to your child's grandparents, and you will warm their hearts for sure on this Grandparents Day. Are your grandparents an important part of your life? Of course they are! 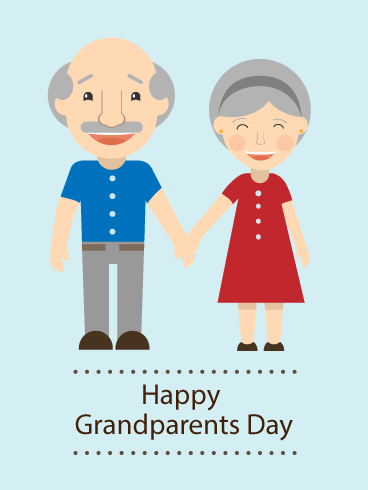 Show them how much they mean to you by sending this lovely Grandparents Day card. 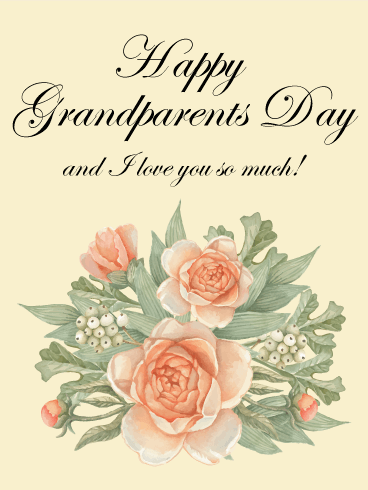 With pretty watercolor flowers on a light yellow background and attractive cursive lettering, this Grandparents Day card will delight your grandparents on their holiday. 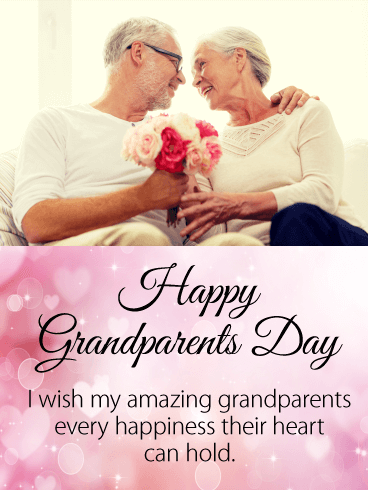 Your grandparents will be touched to receive this beautiful Grandparents Day card that commemorates their special day and your love for them. Grandparents are always there for us with their love and support. Now it's time to show your appreciation for them on Grandparents Day with a special Grandparents Day card! Show your grandparents how much you value them with this lovely Grandparents Day card. With pink orchids and carnations and a yellow rose, this gorgeous Grandparents Day card will delight your grandparents on their special day. 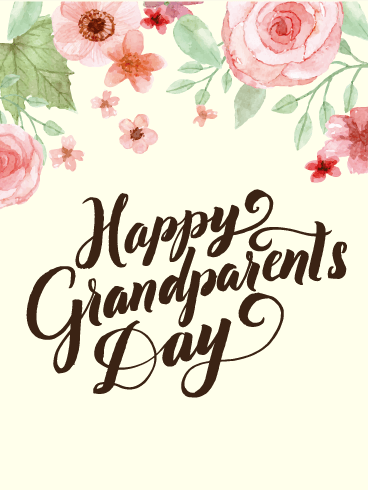 Send them this beautiful Grandparents Day card with your love. Do you love your grandparents and cherish the close relationship you have with them? 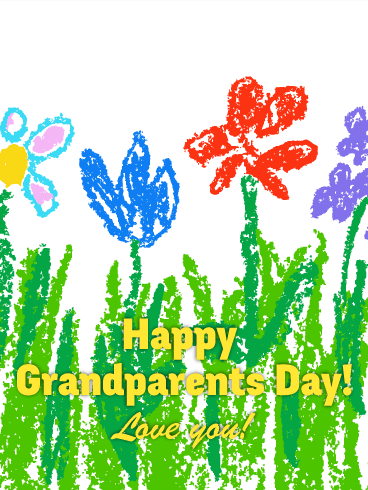 Let them know by sending this Grandparents Day card! The beautiful ring of flowers will be a sweet gift and the kind message will tell them how much you appreciate the love they share. 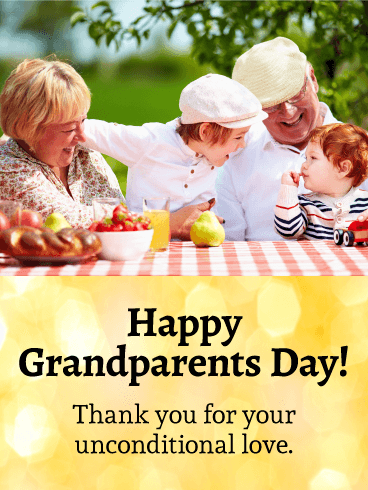 Make this Grandparents Day extra special by sending this touching card today! 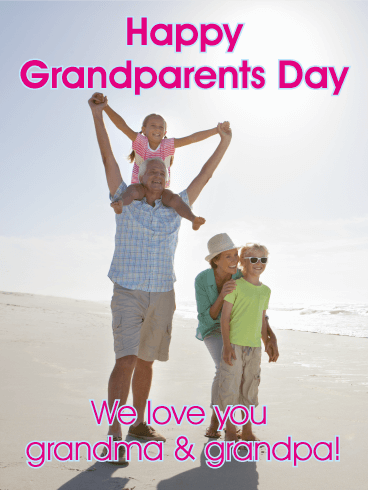 Tell your grandparents how much you love them by sending this Grandparents Day card! The beautifully drawn bouquet of flowers will bring a smile to their faces and the heartfelt message will show how much you care. Thank them for the care and time they've given you with this sweet card. 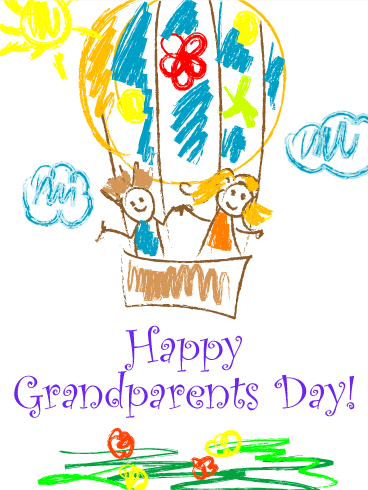 Make this the best Grandparents Day ever by sending this card today! No one is better than your grandparents! This year, tell them how important and special they are with this adorable Grandparents Day card! The smiles and humor in the card will make them laugh and your message will show them how much you care about them. Show your grandparents how amazing they are by celebrating Grandparents Day with this card! How amazing are your grandparents? Are they the best, most loving, and generous people you know? 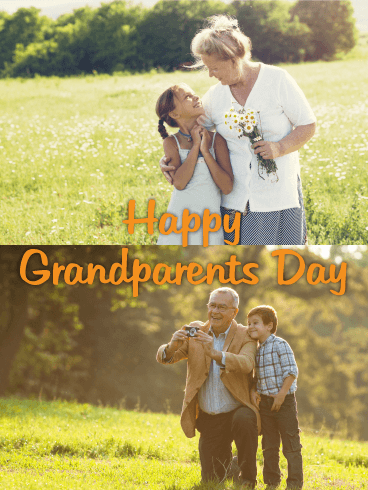 Celebrate them this year with a Grandparents Day card! The funny picture, sweet message, and heart design on this card are the perfect way to share your love. Make this Grandparents Day the best day of the year for the best grandparents you know!